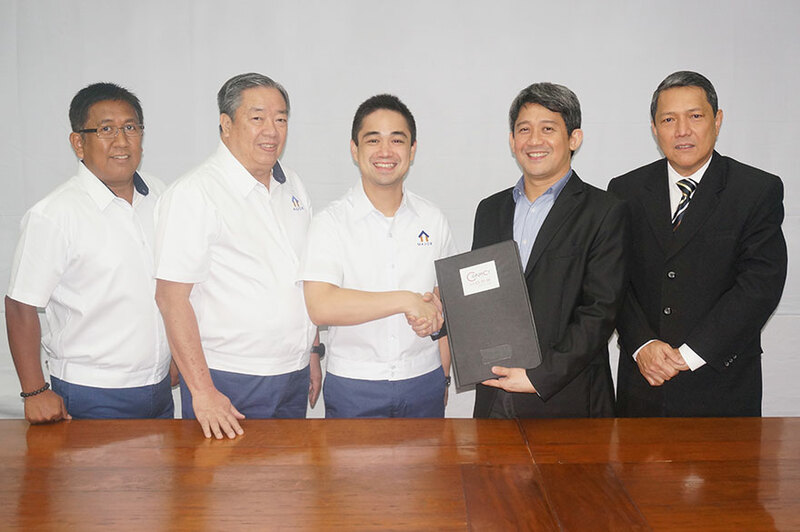 PLDT HOME, Major Homes partner to bring future­ready technology to families | Major Homes Inc.
(From L-­R): Elmer Castro (Head of Engineering and Construction, Major Homes), Gilberto Garcia (EVP, Major Homes), Quinto Oreta (President, Major Homes), Ariel Fermin Raul Alvarez (PLDT EVP and head of HOME business), and Raul Alvarez (PLDT VP and head of Home marketing support). PLDT HOME, the country’s leading provider of advanced communi­ cation and multi­media services, recently entered a strategic partner­ ship with Major Homes, a full­service real estate development com­ pany. The partnership will equip Major Homes’ Space Condormitels in Manila with Fibr, HOME’S most powerful broadband. Backed by PLDT’s over 71,000 kilometers of future-ready fiber network, Fibr enables seamless, simultaneous streaming of high-definition content in all devices with its high-speed Internet, Clickplay movies-on-demand, and Cignal Digital TV channels. “Major Homes’ mission is to build happy communities where families live fully in quality living spaces. Our partnership with PLDT HOME allows us to offer more convenience to our unit buyers as moving in becomes easier for them. They will no longer have to undergo the hassle of finding and applying for a multimedia service provider because once they move in, their homes are future-ready,” said Quinto Oreta, Major Homes president. “Connectivity is increasingly prioritized by those who purchase condominium units, which is natural given that condominiums are designed to offer convenience among its attractions. Unit owners want cable TV, landline, and broadband to be easily available to them when they move in. Through our partnership with Major Homes, each unit is now future-ready and fully connected, making each home a place to make the strongest family connections,” added Ariel Fermin, PLDT EVP and head of HOME business. Shown sealing the strategic partnership are Quinto Oreta (3rd from left) and Ariel Fermin (4th from left). Also in photo are (L-R): Elmer Castro, Major Homes head of engineering and construction; Gilberto Garcia, Major Homes executive vice president; and Raul Alvarez, PLDT VP and head of HOME marketing support.